Well we were not able to find Servas hosts in Croatia or Slovenia. We stayed at a place which advertised ZIMMER at Otocac NW of Split near Senj. It was fine. Drove in to Split on Friday on the flash new motorway - the bloke at the toll booth referred to the motorway as the baby, not 2 years old yet. It was beautiful - a bit expensive for us but really beautiful scenery with the gorgeous fall colours everywhere. We had a good wander round Split (worth the visit even though it"s very touristy) and then went to Trogir - similar. The streets or rather alleyways are hardly wide enough for a motorbike! They are NARROW! Pedestrians only. Some of this stuff is up to 400 yrs old. As we left Trogir we were looking for another zimmer (room to rent). Went into the Primosten area - gorgeous but expensive. We found a place - Rudi´s apartmani.... absolutely fantastic! (Hope I get some photos up for you.) The apartment looked out over the Adriatic Sea.... just so peaceful. Just about all the buildings round here are white with red tiled rooves. Looked like what we imagined Greece to look like. We have just about finished the pumpernickel bread (Meggi from germany), finished her apples, ate all Julianna´s pears (Hungary) and most of the apples. The wine from the cellars where Miklos took us in Hungary tastes great. We should have bought 3 bottles even if they do come in plastic coke bottles. Our apartment in Primosten (Croatia) could have housed a few more folk as there were 2 beds in the attic and plenty of room in the longe. Balconies off bedroom and lounge. We found tennis on TV and surprise surprise... CNN in English! Don't know when we last heard English speaking TV... Ireland? The lady who owned the apartment also gave us 2 bottles of beer! What a lovely touch even if I'm not a great beer drinker. Weather reached 26. Forgot to mention the great tunnels we went through on the motorway to Split. Two of them were each 5 or 6 km long. Wish we had some of these in Oz to solve our Blue Mountains problem. The gigantic bridges are really impressive stretching from one mountain to another. Fay walked back along one to take photos but I wasn't even game to do that. We finally left and headed up the coast road from Primosten to Rijeka and then wandered inland into Slovenia. Those Croatians can certainly build roads and bridges. Not much there if you don't like the coast. I don't think Cousin Patrick could feed 3 of his prize cattle on all the grass we saw in Croatia, but if you want rocks.... it's the place to go. Lovely people and English fairly common. Some of the islands we saw made us think they'd transplanted Uluru from Central Oz... they were huge and they were stark. The Pug continues to amaze us. How it fitted betweenn the bus and the wall and slip down a few other narrow alleyways I don't know. It also had to respond to a few late calls, "NO! LEFT!" But we made it 'm pleased to say. Had to resort to going down a couple of one way streets the wrong way, and to use the left side of the road on the odd occasion, but our bright red plates help, plus a big F on the back... everyone knows we're French! Between Trieste and Ljubljana we saw Predjanski grad (a castle set in the side of a cliff... no kidding.) What a magic setting. Then onto Bled where we found accommodation in a pension for $43. Then a 1 hr walk down a gorge followed by a walk round the lake.... all 6 km of it. (You'd have loved it Army.) There's a castle looking down on the lake and a huge church on the only island in the lake. Quite incredible. I could imagine my good friend Cookie jogging round the lake a couple of times. Dinner at night in Bled cost 4,550 SIT. Accomm was 6,000 SIT. Question is will we make it back to Paris by 9 November? Now in Austria and head to Germany Wednesday. You might even have to wait till we get home julie. That'll give me something to blog about next year eh? Just putting photos on. 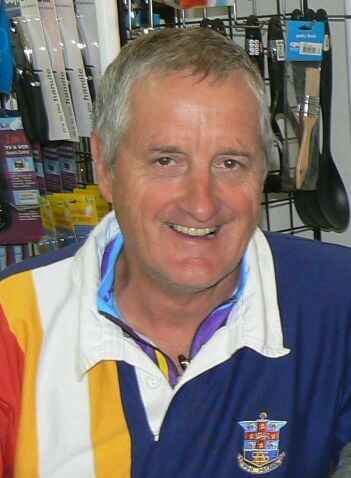 Thinking of the Pritchard family in Western Australia this morning as they had the service for my great mate Bob. Great eulogy by #1 son Geoff. Well done team. Sure wish we coulda been there. Still on track to get to Paris BEFORE plane flies out on 11 Nov. Nearly lost Peugeot 307 under a heap of snow two days in a row! We'd forgotten what that was like! Been away from your blog for awhile. I'm happy to see you two are still on the journey of a lifetime! So you fly home on 11 Nov?????????? I thought I remembered that Nov was the conclusion. It has to seem like time has just flown fly! So sorry to hear about your friend Bob's passing. What a great tribute you posted about him--he and anyone that reads it can be proud to have known him. We're reading books about retirement and learning a lot. Chari is struggling to decide how soon to retire. I vote NOW and she plans (currently) May 2008. I'm ok with either. We're all doing great here. Winter is just about to take hold, though this week will be very nice out. Best wishes on your return home.